Sizes: approx. 2.087 x 1.69 inch (ca. 53 x 43 mm) slide; 0.157 inch (4 mm) diamater cord, 18.5 inch (47 cm) long. In an Anishinaabe world view perspective, however, the distinction that is being made between the Morning Star and the Evening Star has a symbolic, or allegorical significance that goes a lot deeper than a mere scientific, empirical description or explanation – as we know it from Western thinking. Nigaabii-anang, also called “star Sinking in Waters” or Women’s Star, is a powerful Aadizookaan and medicine man who resides in the land of E-bangishimog (the Spirit of the West) and Ningaabii’ani-noodin (the West Wind). Nigaabii-anang is the patron of all women and was once the elder anfd tutor of Waaban (the Dawn). Representing old age and wisdom, he teaches healing and the need for moderation and patience. He symbolized a force contrary to that of Waaban, and the conflict that resulted from this images the lasting human conflict on earth between knowledge and wisdom, between youth and age. 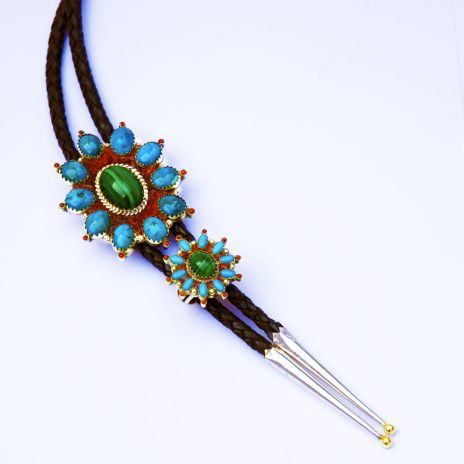 The bolo tie, which jeweler Zhaawano designed as a tribute to the Evening Star, consists of a star-shaped slide attached to a leather cord equipped with conical tips of silver and gold ball end tips – the latter symbolizing planet Venus reflecting the light of the Day-Sun. The slide is made of gold and has a silver back. 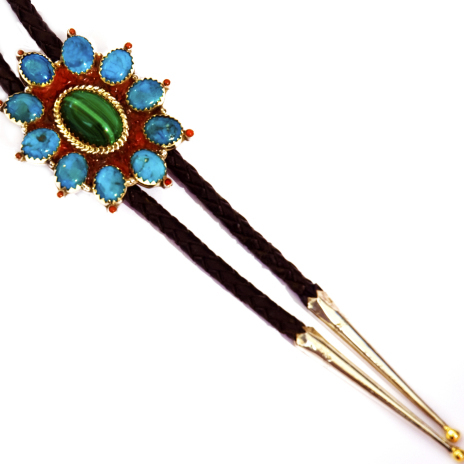 The oval malachite stone in the middle, set in gold, is surrounded by red coral fragment inlay, 10 balls of gold, and – depicting the rays of the star - 10 oval turquoise stones set in gold, each tipped wit small red coral cabochons, also set in gold. The green of the large oval malachite stone cabochon in the middle stands for Omizakamigokwe, the Earthmother, source of all life and also for the primacy of the women of our Nations who have the Evening Star as their patron; the blue color of the turquoise stones and the red coral surrounding the center stone denote, respectively, the water of the lakes and the fire of the setting sun of which the Evening Star was conceived. 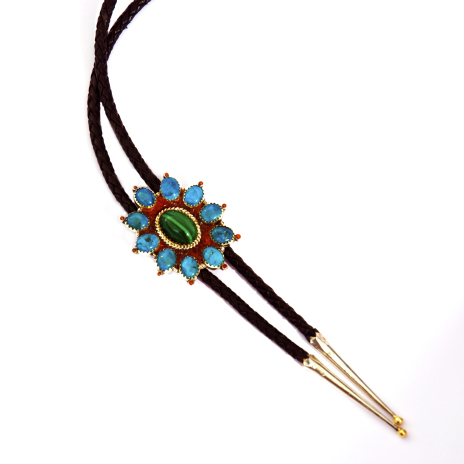 See our Art Blog to read more about the symbolic background of the bolo tie. 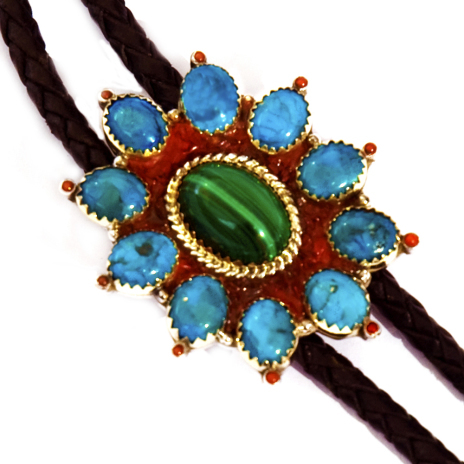 Click here to view the Morning Star - a matching women's ring - and here to see Day Star, a set of the above bolo tie coupled with the Morning Star ring.